The general idea of this deck is to abuse multiple dragon-type Synchro engines alongside the Felgrand Dragon-type support. 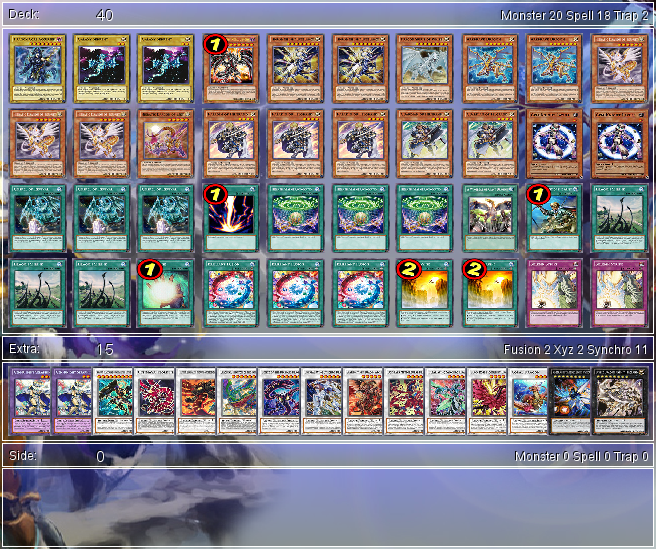 Dragon's Core is all about Ultimaya, and is easy to bring out using Hieratic + Paladin/Guardian of Felgrand. Otherwise, I think the deck choices are pretty much self explanatory, let me know what you think! Could probably drop Chaofeng for Ancient Fairy. With no Wyrms in the deck, its only real use is its floating effect to search a Tuner. You could probably also drop a Seraphinite or the Onimaru for Hot Red Dragon Archfiend Bane, who can drop two Galaxy Serpents with its on-battle-damage effect to potentially Synchro into a King Calamity with a revived Scarlight.